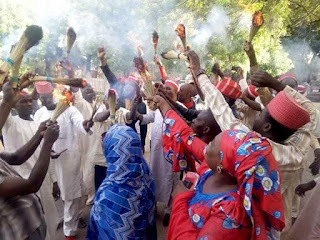 The All Progressives Congress(APC) in Bauchi State has suffered a heavy setback as the opposition Peoples Democratic Party(PDP) gets a massive boost following the defection of 10,000 supporters of the ruling party to the PDP. This happened during the PDP's presidential campaign rally at the Abubakar Tafawa Balewa Memorial Stadium. The state's former deputy governor, Sagir Aminu Saleh led the defections. Alexreports learnt that the decampees, while announcing their defection, stated that while in the ruling party, they didn't gain anything; rather, they lost precious time and resources. They publicly burnt heaps of brooms – the symbol the APC. The defectors were received into the PDP by Governor Ibrahim Hassan Dankwambo of Gombe, who is also the party's zonal presidential campaign coordinator. The governor assured them of vital roles in the party in its determination to win the forthcoming elections. Also speaking during the occasion, the director general of the PDP's gubernatorial campaign in the state, Senator Abdul Ahmed Ningi, assured the defectors that they would be carried along in the scheme of things; stating that they are important to the PDP at this moment of campaigns. The PDP's chairman in Bauchi, Hamza Koshe Akuyam, expressed optimism that all elections in the state would be won by the party. He noted that the state's electorate were disappointed by the APC's abysmal performance in the state.